You can of course make this tasty dish with normal pasta but we recommend you try our chilli flavoured ‘Fileja’ pasta. 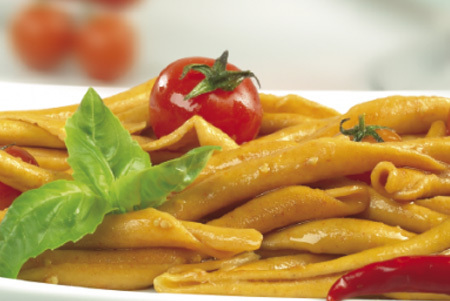 If you haven’t heard of it before Fileja is a traditional Calabrian pasta, rolled by hand around a knitting needle or skewer. Step 1. In a large pan bring water to the boil, add a generous amount of salt, then the pasta. Cook the chilli pasta as directed on the packet, until ‘al dente’. Step 3. Chop the tomatoes into quarters and add to the saucepan, add a pinch of salt and sauté for roughly ten minutes until the tomatoes collapse and become soft. To give this recipe an authentic Calabrian kick you can of course add some extra fresh or dried chillies at the end or if you prefer just dust with some freshly grated parmesan!